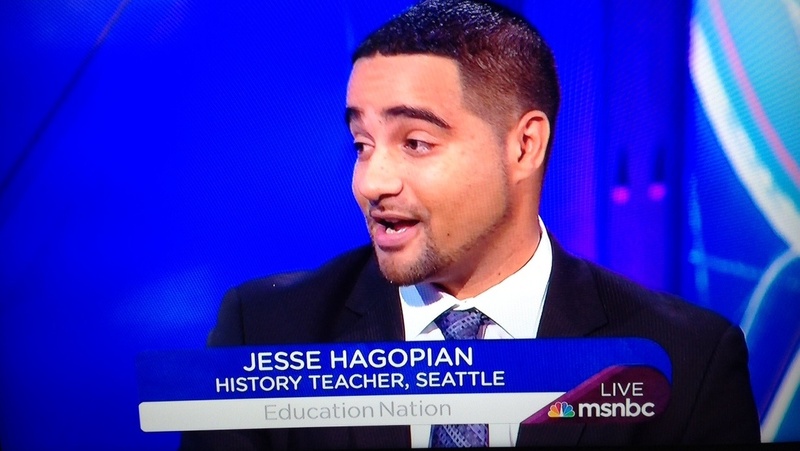 Jesse Hagopian is a Seattle teacher, anti-racist activist and co-editor of Teaching for Black Lives who helped organize the founding actions of “Black Lives Matter at School.” He recently talked to Socialist Worker’s Danny Katch about the importance of this year’s BLM at School week of action, set for February 4-8, as the initiative spreads around the country. 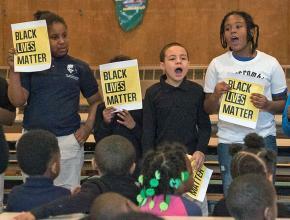 CAN YOU describe the Black Lives Matter at School week of action and how it got started? IT BEGAN as a grassroots effort at John Muir Elementary here in Seattle, where teachers and community members partnered together. It was educators at the school, along with a group called Black Men United to Change the Narrative, who wanted to hold an event to celebrate their Black students early in the 2016 school year. An art teacher, Julie Trout, designed a beautiful shirt that said “Black Lives Matter, We Stand Together.” When the white nationalists found out about that, they began inundating the school with hate mail. Then one hateful person made a bomb threat on the school for the audacity of the community and teachers to declare that their Black students lives have value. So myself and several members of the Social Equity Educators, the social justice caucus inside the Seattle Education Association, went to meet with some of those educators to talk about how we could support them. We got a resolution passed in the union in support of our day of action, but we weren’t sure if people would really follow through on that vote and take action on the day that was set for a citywide Black Lives Matter at School Day in solidarity with John Muir. Then the t-shirt orders started coming in, first by the hundreds and then the thousands. We ended up with somewhere around 3,000 educators in Seattle out of 5,000 total coming to school with shirts that said “Black Lives Matter.” Many of them had #SayHerName to raise awareness about police violence against women. Many educators taught lessons about institutional racism that day. It was a powerful action that attracted local and national media attention. What’s incredible is that educators in Rochester, New York, and Philadelphia saw what we had done and organized their own BLM at School actions independently of us. In Philly, they actually expanded it to a whole week of action. That’s when we began coordinating with them the following year to have a national Black Lives Matter at School Week. Thousands of teachers across the country participated last year in the week of action in over 20 cities. Many of those cities we directly coordinated with and helped to organize, and some of the cities just heard about it and organized their own actions. THERE’S A new demand this year: Fund counselors not cops. How did this come about? LAST YEAR, we came together as a national movement with three demands. The first was to end zero-tolerance discipline and replace it with restorative justice, the second was to hire more Black teachers, and the third was to have Black history and ethnic studies in the schools. In addition to that, we broke down the 13 principles of the BLM global network into teaching points for each day of the week. The demand is a response to the growing movement in this country that was really brought forward in a campaign by a group called Dignity in Schools around the truly destructive nature of what they call School Resource Officers, but which are really putting cops in schools. It’s been really brutal for Black and Brown children. There are numerous examples over the last couple of years of the type of brutality that the police bring into our schools. Recently, the ACLU won a settlement for third graders in Kentucky who were being handcuffed by police officers — not around the wrists because their wrists were too small, so they cuffed them around the biceps. These were special needs kids, Latino and Black, who were having some trouble. Instead of getting help, they were further traumatized. There are examples in my own King County here in Washington state, where kids scribbled on a wall and were charged with property damage. They had to go through the juvenile system instead of having a talking-to or bringing parents and teachers together to figure out how to solve the problem. We now are in a situation in America where there are 1.6 million children who go to a school that doesn’t have a counselor, but that does have a police officer. That tells you a lot about the over-policing of highly segregated schools and the lack of vision around supporting our youth. SPEAKING OF that, Betsy DeVos recently rolled back some of the Obama-era reforms aimed at reducing racial discrepancies in school suspensions. What do you think of that decision? IT’S REALLY outrageous. You think about all the reforms she could be pushing for that could actually improve public education: more funding and counselors, lowering class sizes, bringing back the arts. Or all the initiatives, from healthy food in schools to having a more diverse teaching staff, which we know would be so important for our children. Instead, she’s choosing to reverse civil rights protections that have been enacted to address the school suspension rates fueling the school-to-prison pipeline. We know that kids who are suspended and expelled are more likely not to graduate, and then are more likely to end up behind bars. These protections were only the very mildest of reforms that were needed. We need more robust action to really sever the school-to-prison pipeline. But even that was too much for her in her quest to dismantle public education and perpetuate some of the worst aspects of institutional racism in the schools. YOU TALKED about how BLM at School arose organically out of Seattle and Philadelphia. How is it nationally coordinated? Many people do great work around education activism, but often from a nonprofit model. This seems to work a little differently. IT’S A different model. It’s organized by monthly national conference calls that anyone who supports the mission and goals of the movement can join. Then we’ve elected a steering committee that can help organize the various activities and agendas for the various committees that have formed. We have a curriculum committee, and a student creative challenge committee that organizes a prompt to help kids create art that can inspire people to join this movement. We have a media committee, an outreach committee. It’s being organized predominantly by educators and some parents around the country who are doing this for free and with no budget. Oftentimes, NGOs have a lot of pressure to seek the next grant, and then they have to confine their message to what the grantees find acceptable. We work with great NGOs that are doing good work, but I think there’s a real power in this activist model of organizing that can break out from some of those confines and organize struggle. I think it’s important, too, that a large part of our focus is about transforming the educator unions. Most of the organizers of this movement are union teachers who are bringing resolutions forward. We actually got the National Education Association, one of largest unions in the country, to vote to support BLM at School week. A lot of different union locals are also passing resolutions and debating these issues out city by city. There’s a tremendous amount of power in bringing together social issues and anti-racist movements with the power of labor. We’re beginning to see the “red state” teachers’ revolt move into blue states. We had a strike wave here in Washington in the fall, and now, it looks like Oakland and Los Angeles are poised to strike. Last year, LA held really important events, including hosting Patrisse Cullors, one of the founders of BLM, at one of their events. I think the union’s ability to bring in issues of over-policing of Black and Brown kids into the message about fighting for funding and teacher pay will help them be successful in winning that strike and transforming public education. ARE YOU seeing the impact of last spring’s strikes in right-to-work states reflected in greater involvement in the planning for this year’s actions? ONE OF the main Black leaders of the Kentucky teachers’ revolt is organizing with us now. She was really excited about the power of the strike and helping to lead it, but also disappointed that there wasn’t more support among educators for fighting against the gang bill that was simultaneously being brought up in Kentucky. She sees how and why we need to organize both the power of labor to defend schools, but then bring in anti-racist struggles if we’re really going to make the schools serve all of our kids. WHAT ARE you hoping to see accomplished with this year’s week of action? WE HOPE to engage tens of thousands of students across the country in lessons that illuminate the 13 principles of the BLM movement. In addition, we hope to help transform the unions to so they see how much more powerful our movements can be if we challenge anti-Black racism head on, and bring in Black struggle and incorporate it into the union struggle. With that in mind, one of the new features of this week of action is that we’re calling on educators, students, parents and community members to hold rallies in their cities on Wednesday, February 6 — or a day that makes sense for your local — at your school board or City Hall, in support of the four demands and calling to make BLM at school. We hope that this new feature — this direct action and rally — will really help pressure school districts to make the reforms that are so desperately needed. Sign Petition to Endorse 2019 Black Lives Matter At School National Week of Action! How to Teach for Black Lives at a time when 1.7 million students go to school with cops, but no counselor.